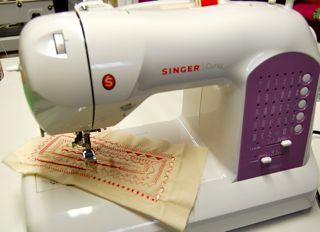 The Singer Style-O-Matic attachment certainly does give you 17 (and more) finishes for your sewing. I will admit I was amazed a while back when I first tried this attachment. They are hard to find, but are worth hunting for! 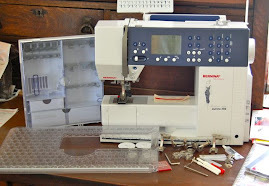 I have what I call a "Reality Check" with this, or any sewing attachment that costs high dollars. I hope to share some of that with you. The more you know, the better you will be able to decide if it is what you really want - of course we want them all! Starting with some of what this attachment does for us - Invisible Blind Stitching and sewing on braid. The way it is designed lets the braid be inserted and then folded back behind the needle. When you sew, you are taking a stitch UNDER the braid and they aren't even seen on top. Really does work very well at this and I found I could speed right along without missing a stitch. The results truly give a professional touch. It was as easy going in circles, curves, or pivoting a corner as it was going straight. I tried another method (of the 17) and put some soutache braid on. I was able to get some nice sharp corners quite easily. 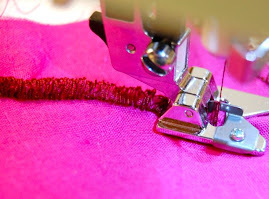 There are three different guides to insert braiding, rickrack, or any embellishment. However, I will tell you more in my "Reality Check". I was able to add edging of rickrack and just grab the tiniest bit of the trimming. I could have also placed this trimming on the bottom of the hem, ins tead of on top. Now, this attachment will sew straight, bind, edge, braid, hemstitch, picot, let you create or insert lace - there are so many things you can do with it. 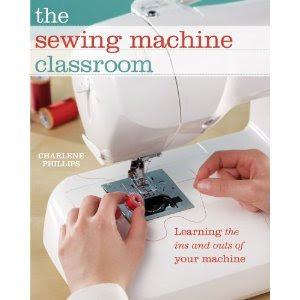 You will really have a fun time just trying each one out and using it for your sewing. It does a wonderful job at putting binding on and you do get a very nice straight stitch. However, although the book (and others who tout this attachment) will lead you to believe that you can use a variety of sizes, be knowledgeable. The book recommends size 5 commercial binding. You must remember, this attachment will not sufficiently do any size binding. Earlier binding sizes were given a number, not inches or centimeters. The no. 5 equates to today's 1/2". Now, you don't want to use the 1/2 inch double fold (see the yellow binding in the photo). Note where your needle will fall with this size. If you have a low shank machine where the needle will move left, center, right - you can adjust it there, however, your needle still may not fall within the proper hole in the attachment. My ruler shows exactly the largest size you can use. The binding must rest against the right hand guide and it gives a clearance of about 1/2". I did a nice work-around by doing a two-tone binding and very easily. I was able to nicely use my 1/2" double fold, along with 1/2" single fold to give a nice double binded edge. Another area to watch is just as with your gathering foot- the amount of gather you get with the attachment. 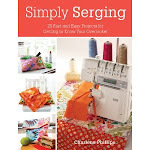 When sewing on a soft, silky fabric you will get very full gathers. I was able to also add a nice ribbon at the same time I was doing the gather. That is the nice part about this attachment. However, remember that the actual fabric determines the amount of gathers with this and your gathering foot. When sewing on even a light-weight linen, the gathers are much more softer. When you add more rows of gathers - creating some smocking - the effect becomes more apparent. Other thoughts - There are many of the 17 finishes the Singer Style-O-Matic does very well with minimal effort. When tucking, bear in mind that the next tuck mark is not produced with this attachment as with your Singer Tucker. Ornamental stitching is done very easily with this attachment, and minimal effort. 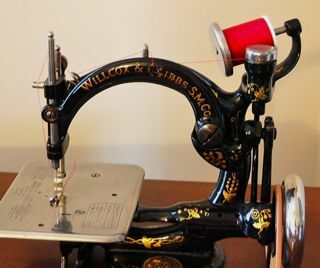 Many of the techniques can be combined, such as shirring and adding invisibly stitched braid. Adding Crochet Lace embellishment to your edging is very easy and quick to do. You can choose a variety of trimmings, so long as they fit in the area outlined earlier. You can have one attachment and change your finishing instantly - which is a nice thing. Just remember, as with the Tucker, not all the innovations of your original Singer attachment are available when using the Style-O-Matic. You can just grab one attachment and head to sewing class, without loading your case down with 5 or 6 attachments or Fashion Aids. 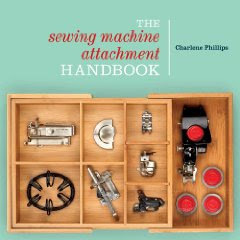 Will I rid myself and eliminate using my wonderful collection of sewing attachments and use only the Style-O-Matic - Never! I do hope my "Reality Check" has provided additional insight and constructive information for you. After all, if you are making the purchase aren't you entitled to all the information the seller may hold? Yes, I believe you are. Charlene, can you tell me where I might be able to find the manual for this attachment? I found the foot, just need the directions for use. Thanks. I don't have an actual Singer manual for this. The best place is to continue searching the internet. When I had mine, and if still had it and the manual would give you a copy, I found the instructions not as clear for me. I created about an 8 page instruction booklet with photos about everything it does. I have it on the web site www.thesewbox.com. You can click the following to get right to the page. Have fun with it as a WONDERFUL attachment.